The Kigali Marriott Hotel opened with a lot of fanfare at the end of 2016 and people have slowly been exploring what it has to offer. They’ve recently opened up their spa, pool, and gym to the public and their lunch and weekend buffets are getting more and more popular. But the real gem of the Marriott, in my opinion, is the hotel’s bar. I don’t know what sort of atmosphere it has in the evening but during the day it’s a really great place for working while enjoying a coffee, cocktail, or a nice meal. I’ve spoken in the past with the Marriott marketing person and they told me they actively encourage people to come, hang out, use their wifi, and work. I really like the giant round tables behind the bar because they’re super spacious and it’s fun to be able to tap away on my laptop while still having a view of the entire bar so I can creep on people coming and going. There are also plenty of comfy padded chairs and a couple of TV screens that usually have football on but without the sound up too loud so it doesn’t ruin the chilled atmosphere. 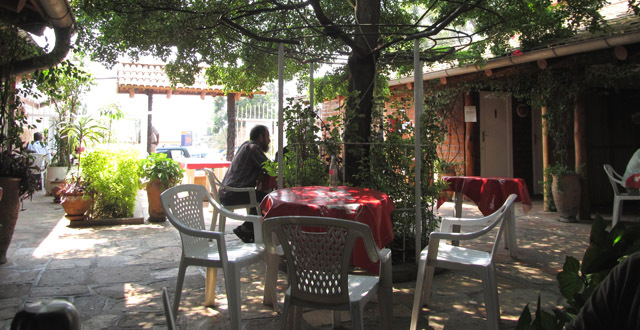 They also have a pretty sweet outdoor seating area if you feel like some fresh air and a nice view. The pricing here is a bit strange. The meals are a lot more affordable than you would expect for the Marriott, especially given that most dishes I’ve had here have been very good and prepared using high quality ingredients. 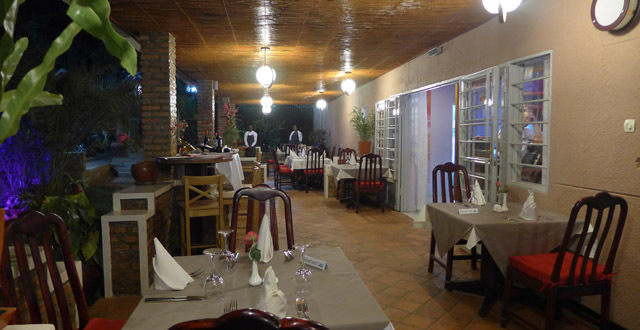 But the alcoholic drinks are another story with the cheapest glass of wine starting at Rwf 8,000 which could come as quite a surprise if you order a glass of wine with your meal without looking at the menu first – so beware! The Marriott is probably the only place where the staff actually pay attention to me when I ask for cold milk with my coffee. I’m pretty sure every other place in Kigali is in default mode for warm milk and can’t fathom my request for something different, no matter how clearly I ask. So it’s nice to feel like the staff here actually pay attention! Plus they serve yummy Question coffee as an added bonus. Beer ranges from Rwf 2,000 to 4,000 with the large draft Mutzig being the best deal (and the most fun to drink from the giant mug) at Rwf 3,000. All of the pop costs Rwf 2,000 (including Coke Zero which is usually a bit more expensive than the rest) and all kinds of different coffees and teas hover around the Rwf 2,500 mark which is cheaper than at some of the nicer cafes in town. I’m not sure who did their drinks pricing but it seems to be all over the place. At Rwf 8,500 each the cocktails are, weirdly, around the same price as the cheapest glass of wine. So when at the Marriott, I’m a cocktail drinker for sure. They’ve got a few to choose from including various flavours of mojitos, a spiked lemonade drink, and a cucumbery gin cocktail. Ive tried a few so far and they’re pretty good. They’re more expensive that a lot of other places but compared to the prices of the rest of the drinks (with single shots of Smirnoff vodka starting at an insane Rwf 4,500), it makes sense to splash out a bit more for a pretty cocktail. As I mentioned, the food here is very good and I’ve enjoyed most of the things I’ve tried. Topping my list is their fish and chips (Rwf 8,500) with crispy beer batter and generous helpings of chips and tartar sauce. I’m going to go out on a limb and say it’s the best fish and chips to be found in Kigali. Sadly, I totally forgot to take a picture but the fish sandwich above is a close imitation and also very tasty. The chips that come with many of the meals here are some of the best in the city, as well. I also really loved the gnocchi Bolognese which is something I’ve never had anywhere else in Kigali. I have to admit to being dubious about this dish at first. I rarely trust menus in Kigali and if it says that the dish comes with Feta, Mozzarella, or Parmesan, I lower my expectations and assume that, while once upon a time the dish may have contained ‘fancy’ cheese, it has probably long since been replaced with Gouda. So when I ordered the baked gnocchi with Parmesan and fresh basil (Rwf 6,500) I highly doubted the presence of either the Parmesan or fresh basil and was pleasantly surprised to find both. This is a huge bowl of food that could probably feed two people at lunch so I’d say it’s pretty good value as well as being a perfect stodgy dish for a rainy or cold Kigali day. The bread used here is insanely good. As in, probably the best bread that I’ve had at any restaurant in Kigali, hands down. The burger buns have just that perfect amount of squishy density and the bread that the Marriott club is served on is completely delicious. I don’t know how the Marriott has gotten bread right where so many other restaurants get it so wrong but they’re onto something here. Because of this, their burgers and sandwiches are excellent. The cheeseburger (Rwf 7,500) is one of the best in the city and their club sandwich is huge and at Rwf 6,000 is one of the best deals on the menu. It’s piled high with veggies and chicken and the bread is the size of your face. If you have a medium-sized face. They also have a small selection of desserts on the menu and so far I’ve tried the chocolate fudge brownie with chocolate sauce (Rwf 5,000) which is just that – a big ol’ brownie smothered in sauce. A bit less sauce and a dollop of cream or ice cream would be nice to cut through the chocolate (I can’t believe I’m saying that) because the dish is pretty heavy. To be fair, I probably shouldn’t have eaten the entire thing… though I do think it was one of my finest feats of food consumption. But really… this monster brownie is probably best shared. I’m 76.3% sure it’s also possible to also order slices of pie and possibly cake from the buffet section. Just ask your waiter to check to see what’s available. The New York cheesecake with blueberry compote (Rwf 5,500) gets good reviews but I would advise you to stay well away from the fruit platter… it’s quite sad. I’m not sure why it arrived at our table shrink-wrapped (maybe it’s because they’d only just recently opened and hadn’t figured everything out yet) but it was small, weird, and not at all worth the Rwf 4,500 they charged. Hopefully it’s improved by now. But, lets be honest, fruit isn’t dessert anyway and people who order it as dessert are obviously freaks and deserve what they get. For fruit-loving freaks who want a nice fruit platter, go to Camellia Tea House instead. Overall I really love the bar area of the Marriott Kigali. I fear that the buffet lunch is a bit too pricey for the likes of me and the bar is a wonderful compromise. I actually prefer it to the larger downstairs restaurant, anyway. The service is friendly and relatively quick, the prices are ok for the quality of the food, and I really love the setup for the inside part of the bar. I’d recommend you give it a try! I think you’ll be pleasantly surprised.